Julie Richards is just starting out on her journey to lose weight, get fit and raise lots of money! At the end of January 2014, Julie’s 11 year old son, Geraint, suffered a catastrophic asthma attack causing him to have a cardiac arrest and leaving him severely brain damaged. From that moment on, life changed dramatically for the Richard’s family. “Food has always been my comfort, and in the last 14 months even more so. We spent 5 months in hospital in Cardiff, then another 3 months in hospital in Surrey. We were with Geraint every moment, learning what to do, which exercises would help and generally providing support. We weren’t eating properly, just grabbing whatever came to hand. And friends and family, at a loss to know what they could do to help, cooked for us – cakes, pasties, big home-cooked dinners that we could just pop in the microwave. I was never a light-weight, but I’ve put on over 2 stone in that time. Now at a size 26 top and size 22 trousers, I knew I had to do something about it. Like most people, I know what I have to do to lose weight, BUT I needed the motivation. I think you have to want to lose weight, to do it for yourself. And this time, I’ve got motivation by the bucketful! I worry about Geraint all the time. I need to be around for him now and in the future. It’s no good being out-of-breath and tired all the time. I need to be fit and healthy and to come out of my comfort zone. The best thing I can do for him right now is to lose weight – and if I’m sponsored for every pound I lose, then I can raise money for the Trust Fund we’ve set up for him for his future. So Slimtone, here I am. I’ve known Marie for a long time and Linda, who runs the Tondu class, is a good friend too. I know that with their help and support, I’m going to succeed. I’ve got no excuses and the Lifestyle Plan is ideal. Everything is so tasty and the whole family can eat the same thing – I can even have my favourite Sunday roast. I’m exercising too – and this from someone who hates it with a passion. I just don’t understand how anyone can go to a gym and enjoy it! But I do love walking, oh yes and chatting! So every week after class I’m joining Linda and some of the other Slimtone members for a walk and a chat – exercise can be fun, after all! At my first weigh-in I was 16 stone 2¼lbs. Marie had brought along a 5lb lump of fat – this is how much you can expect to lose every month! It was horrid. No wonder I’m out-of-breath and tired, this extra weight is like carrying a small child around with me all the time! My journey has begun – my target is to lose 5 stone in the next 12 months. I’ve weighed, I’ve measured and I’ve had my cholesterol checked. You can keep track of my success here on the Slimtone blog and on Slimtone’s Facebook page too – and if you’d like to sponsor me, that would be great. Thank you. Do you want to join Julie on her weight loss journey? Get your copy of the Lifestyle Plan here or come and join a Slimtone class locally or online – you’re always welcome! The pack provides all the ingredients for healthy weight loss. The new Lifestyle Book has over 150 delicious recipes. The 4 weekly pre planned menus also included will give you lots of new ideas for planning your meals. There is also a new Shopping Guide of the Slimtone members’ favourite brands. The personal progress chart is great seeing the inches as well as weight melting away is really motivational. One of the most important is a food diary so many have found following our advice to “when you bite it write it” the key to their success. The pack will be available online soon for £7.99 but will be available to class members at the special price of only £4.50. The fee for New and re- join members is now £7.00 but for February and March this includes a complimentary pack making the first week fee only £2.50. Congratulations to everyone who took part in our competition and for the tremendous weight losses in the classes this year. A special mention to Tony in our Maesteg class who has lost 4 stone since August and to Emily from the Garw class who looked fab in our recent Christmas Dinner. 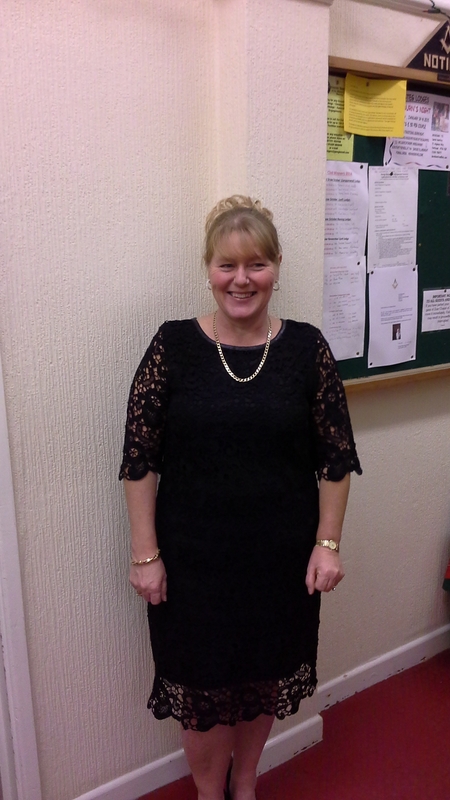 Also congratulations to Susan from our Ogmore class pictured here in our dinner at the Masonic Hall. Sue lost over three stone in three months and has maintained this loss for nearly 10 years and as you can see is looking fab. Have a wonderful Christmas and classes start back from Friday 2nd January 2015. Can I remind everyone if you have any tempting goodies left after the holiday bring them into class to be distributed to the local food banks. These yoghurts are a favourite of mine and are also available in Blueberry and Strawberry flavour. Both would be ideal for this recipe without the lemon flavouring. Will be letting you know the successful members who are the winners in the competition soon. If you need inspiration to maintain your healthy eating during December take a look at our successful slimmers on our website and their story on http://www.slimtone.co.uk/ As you can see they have different lifestyles but could all lose weight with our Slimtone Lifestyle plan. You will also find lots of low fat alternatives listed of Christmas favourites with masses of taste and flavour but a lot less calories. Congratulations to all our members for their fantastic weight losses and really looking forward to seeing who will win our Slim for Santa competition. This will take place in each class and the final winner during our Christmas Dinner on the 18th December. Congratulations to all the members who are doing so well in our Slim for Santa competition in all the classes and now have lots of baubles on their trees. If you are busy Christmas shopping with no time to cook and plan week 5 of your Lifestyle Book is the answer to your problem. They are all quick and easy menues which will save you time and money. When thinking of sending for that takeaway just remember when you drop the “S” from fast food you are left with FAT FOOD. Still four weeks to go before all the festivities don’t give in now still time to lose some weight and inches.!!!!! So pleased everyone liked our new ideas and menu plan which we launched in the classes last week. It has been designed with lots of recipes for keeping warm during the colder weather. Also, the low G.I suggestions will keep you satisfied for so much longer than all the snacks which contain so much hidden sugars. Apologies for no blog last week our computer was attacked by lightening and thanks to Ty from Bridgend web design who did all the necessary repairs we are back to “normal”. ** Everyone in class agrees that the free soups in our plan make such a big difference before a meal. It has been proven that it help lose weight as we are more satisfied and prevents all the “picking” that can happen later in the day. I find making a toastie for lunch from the new plan or any of the suggestion on page 21 of your Lifestyle book really satisfying. Especially with a portion of the carrot and coriander or red pepper and butternut squash soup both of which are negligible in calories. Another good idea is when making the leek and potato soup is to use sweet potato it makes a fab flavour and as it’s low G.I. so as we all now will provide slow release energy which is great in the Winter. Keep at the plan only 5 weeks to go ???? Enter your email address to subscribe to this Marie's Blog and receive notifications of new posts by email.